Born in 1906 at Bazeilles, a village in the east of France, Abel Brion, having excelled in secondary school, was accepted in 1925 after an entrance examination by the veterinary school of Alfort. During each of the four years of his veterinary studies, he was top of his class. The teaching staff of the school observed his exceptional qualities of application and intellect, and convinced him to become a veterinary teacher. Brion chose the academic discipline of veterinary medicine and was nominated in 1936 as Professor of Medicine at the Veterinary School of Lyon. Between 1939-1940, he served in the Army in a veterinary hospital. 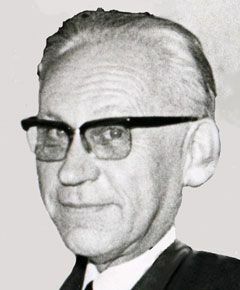 He returned to the veterinary school of Alfort in 1956, where he stayed until his retirement in 1972. The fortunate students who experienced the teaching of Professor Abel Brion will always remember the excellence of his lectures and courses. He spoke with ease, and so clearly and accurately that he made even difficult subjects easily understood. The veterinary schools in France were mainly concerned with cattle at this time, but in 1959 Professor Brion was the first to foresee the development of the French poultry industry and to begin the teaching of avian pathology in Alfort. In his laboratory the major avian diseases of the 1960s and 1970s were investigated. A new vaccine strain of Newcastle disease virus was isolated. The etiology and the means to prevent and treat chronic respiratory disease were also studied, as were avian encephalomyelitis, avian infectious bronchitis and nutritional encephalomalacia. Professor Brion published 270 scientific papers and 150 popular articles. He was a member of the Academie Vétérinaire, Académie de Medecine of France, the Royal Academy of Belgium and the World Veterinary Poultry Association. He participated in the creation and development of the WVPA and the journal Avian Pathology, the first issue of which was published in 1972. He organized the III WVPA congress in Paris in 1965. In summary, he was a very great professor, a great manager of teams of researchers, and was known and respected worldwide. WVPA thanks Georges Bennejean for compiling this profile.